IMPORTANT: Do not eat raw! 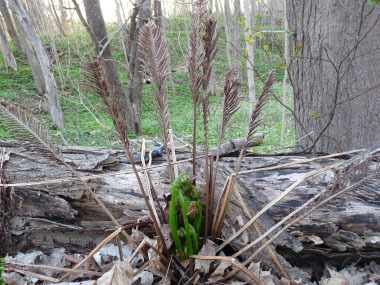 The ostrich fern is one of spring’s early risers. This perennial fern develops a rosette of arching leaves that can grow to over 1 metre (3') tall during late spring. Named after the Ancient Greek struthio meaning ostrich and pterion meaning wing, the common and scientific names refer to the large, feather-like shape of the fern. Ostrich ferns are native to North America and grow quite well in USDA plant hardiness zones 3 to 7. They are also a popular fern used in gardens. They grow rapidly, up to several centimetres (inches) a day under optimum conditions, so the harvesting season in a given location is quite short. 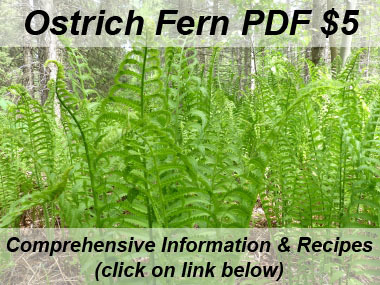 Distinguishing Features: Ostrich ferns are easy to identify as they have a smooth, green stem that has a deep, u-shaped groove on the inside of the stem. Ostrich ferns grow in vase-shaped clumps called crowns. These crowns are somewhat reminescent to large upside down pine cone-like structures. Sometimes you will not see these crowns as they are covered in moss. There are generally six to eight fronds per crown. 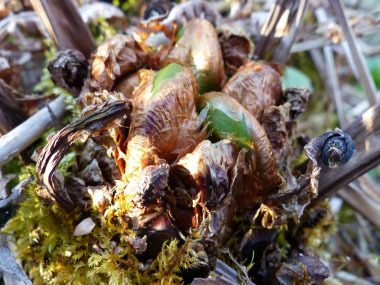 As they emerge they are covered with a brown sheath. Ostrich fern fiddlehead stems are never hairy, always smooth. 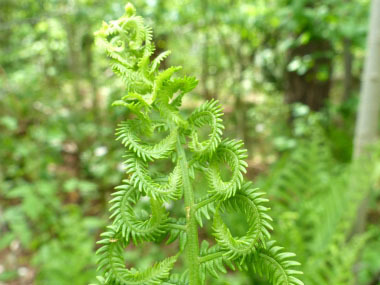 Fields of Nutrition has medicinal benefits and vitamin/mineral content of Fiddlehead. Leaves: The compound leaves are pinnate-pinnatifid and dimorphic. Sterile leaves are much larger than the fertile leaves in the center of the rosette. The sterile leaves are up to 1.60 m (5') long, 30 cm (12") across, and oblanceolate in outline, consisting of 20-50 pairs of leaflets. The sterile leaves taper abruptly toward their tips, while toward their bases the leaflets become very small. Individual leaflets are up to 15 cm (6") long, linear-oblong in outline, and deeply pinnatifid with 15-40 pairs of lobes. These lobes are short-oblong to ovate in shape, while their margins are smooth and folded downward. The sterile leaves are medium to dark green and glabrous on their upper surfaces, while their lower surfaces are light to medium green and glabrous. 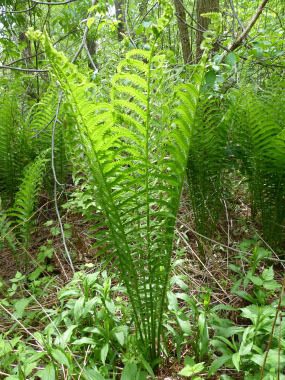 Height: Ostrich ferns generally grow anywhere from 90 to 120cm (35" to 47") and the ferns from one crown spreads anywhere from 60 to 90 cm (25" to 35") wide. 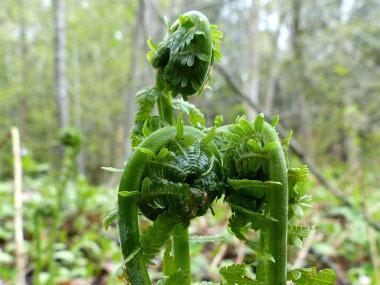 Habitat: Fiddleheads are frequently found in forests in which the soil is damp and rich. It also prefers areas within a forest in which they get some sunlight. They are also found along streams and brooks in wooded areas. 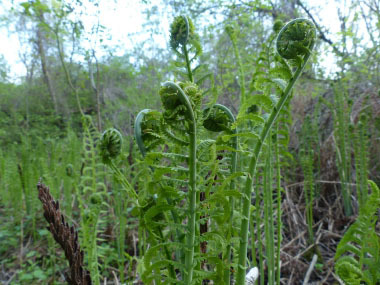 Edible parts: The unfurled part of the fern (the crozier) is the part of this fern that is edible. Be sure the curl is tight. About 1 to 2 cm (1") of the stem with the crozier can be eaten as well. NEVER eat raw and always be sure they are properly cooked. Other name: Ostrich Fern Fiddleheads.